This week was going to be another trip to Pool Hall fishery, but this time I was going to check out the runs water. On my last visit to Poolhall some of the regulars was telling me about the runs water and how it's so easy to catch the catch. I had briefly looked at the lake before leaving after the last visit, and I must say it did look very carpy. It's a very long and narrow lake full of reed bushes and lined with trees. It also contains numerous lily pads scattered around the whole lake. I arrived in the morning and was accompanied by my father who wanted to try a runs water out to get some practice in. We took a stroll around the water but this wasn't to locate carp, there's no need they're everywhere. It was for us to find a pair of comfortable swims for which we can stay for 2 days. In the end we picked 2 pegs that were only 6 feet apart, and located in the middle of the lake where it opens out in the shape of a triangle. Here we had lots of features to aim for, there was little island bushes, lilies and reeds. The pegs was also comfortable and we could just fit our huge bivvy into them. 12pm: We both start with a bit of spodding. I had brought some freshly cooked particles consisting of chick peas, black eyed beans, hemp and green gunco peas. These particles are very cheap, I can make up over 20 kilos for less than £15. An ideal way to fish for carp on a budget! Within ten minutes of spodding I could see signs of fish feeding on the particle baits. I immediately cast in a rig, and before I picked up the second rod to cast, the rod was off as the tip bounced off the pod. Wow what a start! Five minutes later a 8 pound common was on the bank. 3pm: By this time I had caught over ten carp, only one was double-figured but it was an exciting start. I kept thinking about what a regular had said about us not getting any sleep for 2 days, and it was starting to look that way so far. .
8pm: Now my fish tally was into 25 carp, all had been commons with a few doubles. One thing I did notice is that all the fish was heading for a huge lily bed as soon as they was hooked. This had caused me to lose about 5 fish and was frustrating as I'm sure one was a good sized carp. We was told that a twenty resided in the runs water but I think it would be hard to land it. We also noticed that the majority of the carp in the runs water had no lips. They had been caught so many time before that the lips had been worn away which wasn't a very nice site to see. The odd one or two also had swollen mouths which could only just about fit small boilies into the gap, again not a nice site. Other than that the fish was in good condition and fought like hell. 11pm: Even in the dark the carp kept coming out. 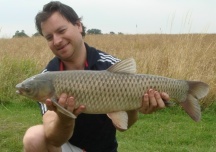 Again more common carp. This was definitely a place to test out new rigs or baits. Even though you'll catch the carp on anything, a good guide would be the number of runs per minute. On many occasions during the day we would have both rods going off at the same time, something that's always exciting if not hectic. 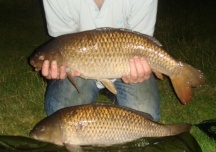 2am: By this time I had caught well over 30 carp that ranged in size between 4 pounds and up to 11 and half pounds. Over 90 percent was common carp and they all fought hard. I felt this would go on all night. The activity of the session had caught up with me and I was tired. I pulled both rods in and went to sleep. I need to preserve some energy for another hectic carp fishing session. 8am: Right, I'm awake and ready for fishing this crazy water once more. First thing though is to have breakfast and a cup of tea, after all, I wont get time once the rods are in the water. I had dropped out some bait before going bed on the night so I was hoping the carp was onto it already. I cast in the first rig and settled the bobbin on the line, crouched down by the rod I didn't get up as I believed it would go off at any time soon. It didn't though, for 2 minutes and no run, what's going on? I started to think it might not be another hectic day like yesterday. Ah well, get the other rod in then. but, as soon as I got up and picked the other rod up off it went! Ah the fish are teasing me surely! Five minutes later another 9 pound common carp was in the net. 11am: Here we go again, another 15 runs and over ten more common carp on the bank. This was going to be a tiring day. Sure enough, this was the case. It was literally a fish a chuck! 6pm: By this time both my father and myself were both knackered. My dad shouted me and he was into one fish with the other rod screaming off on a single-toner. I gave him a hand and within 5 minutes there was a brace of common carp on the bank, both was into double figures. Well done Mac! 9pm: The hectic fishing carried on through the night, and it was gone 4am by the time I took the rods out for my bed time. The last day was exactly the same as the others. We kept catching common carp time after time. I think some of the fish we had already caught the day before. Our trip to Pool hall fishery runs water was very enjoyable, although not relaxing at all, but still fun. It was very different to have so many takes in a single day. For many years I had got used to fishing places like the RMC, Linear and some syndicate waters in Gloucestershire, and many trips are carefully planned out with the realistic view of catching 2 or 3 carp per day. But, at Pool hall you really have to be ready for those heart racing runs!